In recent years there has been a bit of a trend to reduce the number of hyphens in our writing – perhaps part of the general tendency towards fewer little marks dotted and dashed around text. We now see fewer double quotation marks, for example, and initials for names are written without full stops these days. 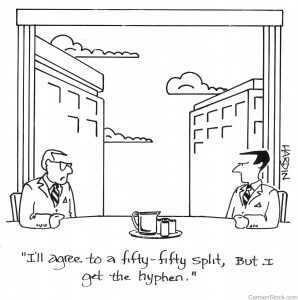 Although not as popular as in the past, the little hyphen is still very useful to help clarify meaning. It is important to use it carefully, though, and to work out a set of guidelines so it doesn’t become wayward. There is one place where we do tend to use too many hyphens; this is in compound words. My guideline for deciding whether a compound word needs a hyphen is a bit intuitive, but it works for me. Is your word an adjective? One way that hyphens are used is to cobble two or more words together to use either as an adjective to describe a thing, as an adverb, to describe an action, or a new noun. These are compound words, that is words made from two or more words linked together. But – these compounds are sometimes given a hyphen when one is not needed! Think about the compound word ‘on-line’. You will see it everywhere, almost every day, and so often it is given a blanket hyphen. So is it on-line or on line? Well, it depends on how you are using it. My ‘rule’ is to say it in your head, or aloud if you like. Think about the stress (emphasis) and where you place it. Do you say it quickly so it sounds like one word, with a mild stress on the first syllable: on-line learning? Or do you say it evenly, perhaps taking a nano-second longer to say it: I am studying on line? If it is used as an adjective, chances are you will say it with the speed and emphasis of the first example – and that’s the way it should be written. We are providing in-house training vs We are training people in house. I live on a one-way street vs You can only travel one way on this street. She is an at-risk client vs She is at risk. They have good on-board entertainment vs You can watch movies on board. There are more guidelines for using hyphens with compounds that behave as nouns. But that is a complicated area, beyond the scope of this post. One thing I will say, though: see how I wrote ‘guidelines’. You would never say ‘guide-lines’, but you might have once. You will only find frustration if you try to look up the ‘rules’ for hyphen use, as really there are no clear rules. This is why it is OK to develop your own set, and to use these consistently within a document. Of course also it’s important to work to the style of your organisation. And like many language questions, usage depends on whether you are in the UK, US or Australia.If you have a favourite dictionary, see what they do, and maybe stick to that. If you would like to follow up with some follow-up reading, have a look at this article. If it doesn’t cause more confusion, it carries the message that hyphens are being used less now and gives plenty of examples of when to use them and when not.